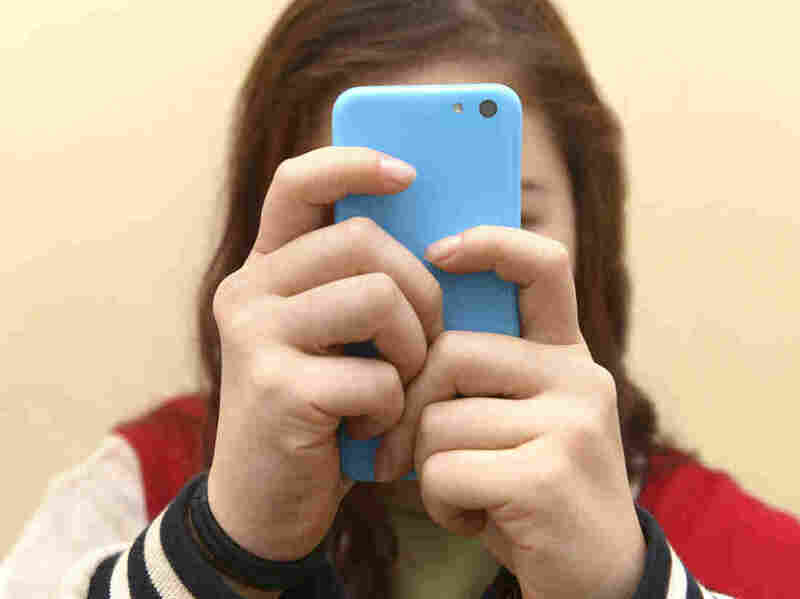 Frequent Smart Phone, Internet Use Linked To Symptoms Of ADHD In Teens : Shots - Health News A new study finds that teens who engage in frequent texting, social media use and other online activities daily are more likely to develop symptoms of ADHD. "It's one of the first studies to look at modern digital media and ADHD risk," says psychologist Adam Leventhal, an associate professor of preventive medicine at the University of Southern California and an author of the study. When considered with previous research showing that greater social media use is associated with depression in teens, the new study suggests that "excessive digital media use doesn't seem to be great for [their] mental health," he adds. Previous research has shown that watching television or playing video games on a console put teenagers at a slightly higher risk of developing ADHD behaviors. But less is known about the impact of computers, tablets and smartphones. Because these tools have evolved very rapidly, there's been little research into the impact of these new technologies on us, says Jenny Radesky, a pediatrician at the University of Michigan, who wrote an editorial about the new study for JAMA. Each new platform reaches millions of people worldwide in a matter of days or weeks, she says. "Angry Birds reached 50 million users within 35 days. Pokémon Go reached the same number in 19 days." Research into their effects hasn't been able to keep pace with the technological evolution, she adds. "So it's nice to finally to have some evidence on longer term impact that [these technologies are] having on children," says Radesky. "I think it shows that something is going on, that there is an association, even if small, between these type[s] of media use habits throughout the day with emerging inattention, trouble with focusing, resisting distraction, controlling your impulses." The study followed 2,587 10th graders in schools in Los Angeles county over two years. The teens showed no symptoms of ADHD at the beginning of the study. By the end, teens with more frequent digital media use were more likely to have symptoms of ADHD. The researchers assessed the students using a standardized questionnaire for ADHD symptoms, including nine symptoms each for inattention and hyperactivity. Students with six or more symptoms in either category were counted as having symptoms of the disorder, based on criteria in the Diagnostic and Statistical Manual Of Mental Disorders. During the two years of the study, the researchers surveyed the teens every six months and asked them about the frequency of their participation in 14 different kinds of online activities such as texting, sharing on social media and streaming videos or music. The students reported how many of the 14 activities they did and how often (0, 1-2 times a week, 1-2 times a day, or many times a day). If they did any activity many times, it counted as "high frequency use." About half of the students said they check social media sites and text many times every day. "These results show that teens are really attached to their [digital] technologies, throughout the day," says Radesky, who wasn't involved in the new study. "It really captured the pervasive design that so many of these mobile technologies have taken on." By and large, students who frequently used six or more activities had a higher likelihood of developing ADHD symptoms. For instance, among the 51 students who frequently did all 14 online activities, 10.5 percent showed ADHD symptoms over the course of the study. And of the 114 teens who frequently did seven digital activities, 9.5 showed symptoms. In contrast, only 4.6 percent of the 495 kids who didn't do any of the activities frequently had new ADHD symptoms over the two-year period. In other words, teens who were high frequency users of seven or 14 digital media platforms were more than twice as likely to develop ADHD symptoms than teens who did not use any media platform at a high frequency rate, notes Leventhal. He and his colleagues statistically controlled for other potential confounding factors like family income level, race/ethnicity and pre-existing mental health conditions. Leventhal is quick to caution that his study does not prove that being plugged into their devices caused ADHD among teens. "We don't know that," he says. Showing ADHD symptoms is not the same as ADHD diagnosis,which is a multi-step process that involves a clinician in addition to the questionnaire. The study did not diagnose any of the kids with ADHD. The study doesn't prove causation — it finds an association. Still, because the study involved students who did not show symptoms in the beginning, the results give some cause for concern, Leventhal says. "To have 10-ish percent [of the high frequency media users] have the occurrence of new symptoms is fairly high," he says. Starting the study with kids who did not have ADHD at baseline was "a smart choice." notes Radesky. "It helps reduce the chicken and egg situation." One of the strengths of the study is that it included a large number of teens from a diverse backgrounds, because "sociodemographic diversity has been a limitation of prior studies on digital media," she writes in the JAMA editorial. While the study doesn't show that all children are at risk of developing problems with attention and hyperactivity, "there is probably a sub-sample of kids who are more vulnerable," notes Radesky. For example, the study found that children with mental health problems were more likely to develop these symptoms. "That's important because those are the kids who are doing their emotional expression online," says Radesky. "They might be getting into more drama online, getting into more cyber bullying. And that can definitely be dysregulating and affect your ability to focus on things." However, the study did have some limitations, she notes. "There are other things changing over time that might explain the results you're seeing," she says. "In this case, they did not collect data on teenagers' sleep. They didn't have information on what the family dynamics were like at home, you know how involved were the parents? ... How much media is being used at home by the parents?" Previous studies have shown that social media use is associated with disturbed sleep, which could itself affect children's ability to focus in school and that might manifest in ADHD-like symptoms. Similarly, "the more parents are on their phone, the more teens are likely to be as well," adds Radesky. Radesky, who co-wrote the American Academy of Pediatrics' media use guidelines, says that she recommends parents and their children pause and reflect on how they use media, so children can understand the benefits and pitfalls of their online habits. "I'd really like teenagers to develop a sense of tech savviness ... so they don't all feel this pressure to be online constantly in order to feel social relevance or acceptance," she says.